This is my male version for this image. I coloured it with the following promarkers - turquoise, powder blue, arctic blue, sky blue, raw sienna, terracotta, chestnut. I used some papers and matching sentiment that were free with a magazine. And cut 6 circles with a punch and turned them into candy. Please pop of to Karleigh Sue challenge blog and share with us your projects. This cake is amazing, I simply love it! The color combo is so elegant! Thanks for playing with us at CCD Linky Party! Hope you had fun! Very nice masculine card! I find them especially challenging and you did great! 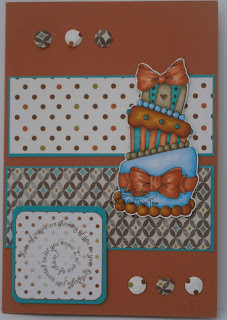 Thanks for joining our Craftin Desert Divas Birthday Linky Party!! Gorgeous card, great colors and design. Thanks for joining us at Card Mania Challenges. Good luck and hope you'll join us again. Such a pretty card - lovely color scheme! Thank you for participating in the MelonHeadz Friends Celebrations Challenge!